Amadeus provides flexible scheduling for students. Although certain days are busier than others, we have many teachers and classrooms, which can be arranged according to the student's needs. If you need to cancel a lesson, simply let us know in advance and we will gladly arrange a make-up lesson for you. Parents are encouraged to talk to the school if they have any questions or concerns, including change of teacher requests. We will gladly arrange lessons with the new teacher. Monthly payment plans are available for students when needed. Every quarter, our Music Director and Department Chairs review the progress of each student with our teachers, making sure that students are on the right track. If for some reason a student is not performing as expected, Amadeus will address any problems immediately. At the same time, parents are encouraged to communicate any concerns that they have, especially if they believe that their child is in need of extra help or if they would like to try a different teacher. Amadeus offers music lessons to adult students of all ages. Whether you are pursuing a new hobby or reconnecting with a childhood passion, we do our best to ensure that you have a great experience. There are two kinds of regular performance given at the Amadeus: recitals and concerts. Recitals are generally held in front of a small, friendly audience and aim to build confidence and prepare students for concert performance. Two recitals are held each year. Concerts, which take place in front of a larger audience, give the students a chance to perform on a big stage, exposing them to a professional performance setting. We strongly believe that performance experience is a vital part of music education. Preparing for performances provides students with a short-term goal, which serves to maintain their interest in playing and increase their level of achievement. 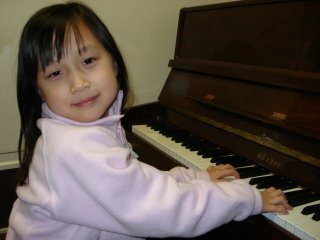 While other music schools charge a fee for concerts, all Amadeus recitals and concerts are free of charge to students. Outstanding students are given the opportunity to perform at various concert halls, such as Carnegie Weill Hall and Flushing Town Hall. Students also get the chance to perform at prestigious events to which Amadeus is frequently invited. Two types of examination are available to the Amadeus students, NYSSMA and ROYAL. Students are strongly encouraged to partcipate in examinations as they can benefit from the experience & from the credentials when applying for college. 1) NYSSMA - Hosted by MENC (Music Educator National Conference), the largest music association in the USA. In New York City alone, at least 70,000 students participate each year. 2) The Royal Music Exam. Students who are interested in taking the following auditions should consult with their teachers. Amadeus is well-known for preparing students for these auditions. Prior to an audition or exam, Amadeus holds mock auditions, which give students a chance to try out their exam skills. These practice tests serve to familiarize students with the audition process, giving them increased comfort & confidence. As a result, students are better able to excel in real auditions and achieve higher scores.